1. To reminisce history of Jalan TAR formally known as Batu Road, it was originally a path leading to the Batu village where mining activities took place. By the 1930s, the swamps, rice fields and coconut estates around Batu Road were replaced by commercial development which created one of the town's busiest streets. 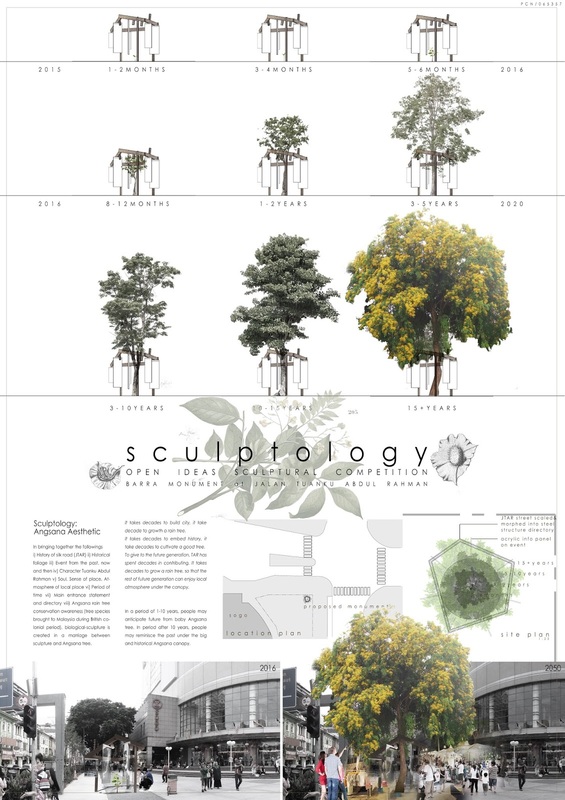 Biological-sculpture is created in a form of marriage between sculpture and Angsana tree. It takes a decade to build a city, it takes a decade to grow a rain tree. It takes a decade to embed history, it takes a decade to cultivate a good tree. To give to the future generation, TAR had spent decades in contributing. It takes a decade to grow a rain tree so that the rest of future generation can enjoy the local atmosphere under the canopy. Spirit of Tuanku Abdul Rahman is interpreted into the growth of an Angsana, manifested in a form of space-time relativity, and then into the built environment. The art of conceiving growth of the Angsana has a concept of time, projecting one into imaginary future of anticipation, back and forth, informing the past and history of it. In the period of 1-10 years, people may anticipate future from the baby the Angsana tree. In the period after 10 years, people may reminisce the past under the big and historical Angsana canopy.